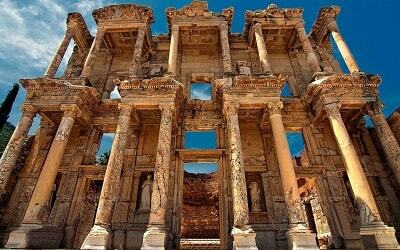 For those of you who are true enthusiasts of traveling, and for those of you who would like to see more then just the gorgeous Marmaris resort, we organize a splendid Marmaris Cappadocia Tour. Our delightful Marmaris Cappadocia Tour starts with a 770kilometer-long ride to Cappadocia. Because this trip is so long, we are employing the services of the best bus company in this area – Rahmi Harmucu company. You will be traveling in fully furnished Mercedes Trevego busses, each of which is equipped with an air conditioning system. During the drive you will be catered, so you can get refreshments and some snacks. After a 13 hours of travel, we will arrive to the Cappadocia Inn Hotel. Once we’ve checked in, we will have a tasty breakfast. Our driver will take you up for a tour through North Cappadocia. We will start by visiting the fantastic Uchisar Castle which consists of many rooms and secret passages carved into mountain rocks. Next, we will go to the Goreme Open Air Museum which is one of the UNESCO’s World Heritage Sites. 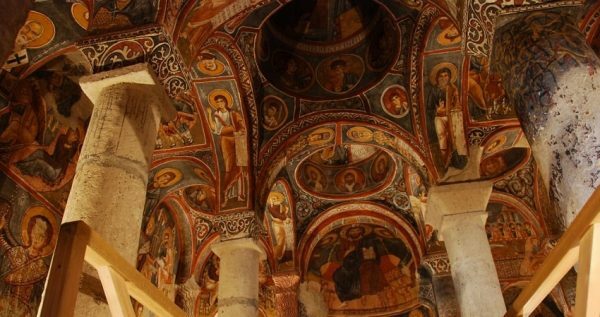 This museum hosts some lovely churches carved into mountain rocks, with some amazingly beautiful frescoes painted on their inner walls. We will also visit the Cavusin Old Greek Village, which hosts Saint John the Baptist’s cave church. This church is rather large in comparison to other cave churches. It consists of three rooms, which were created out of the original one, due to the straightening of the support-columns. Afterwards, we will head out to Pasabag which has some unusual fairy chimneys with even three or two caps on top. After a lunch in Pasabag, we will visit Saint Simeon’s chapel, and a hermit’s shelter cut into one of the three-capped chimneys. We will then go to Avanos to observe their red clay pottery production. Local pot-makers gather their marvelous red clay from the shore of the adjoining Red River. Next is Devrent Valley very popular for its moonscape-like rock formations. 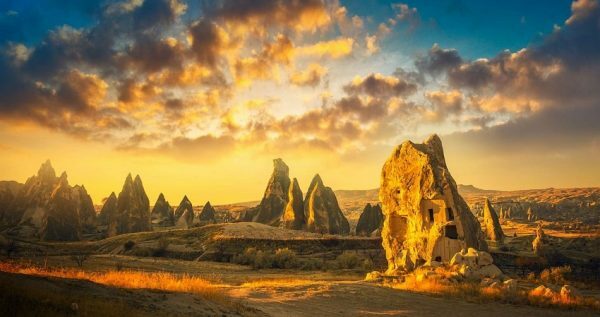 We will also visit Urgup and see its large fairy chimneys, and a traditional carpet factory in Goreme, where you will learn how the renowned Turkish rugs and kilims are made. Afterwards, our driver will take you for a relaxing drive back to the hotel. 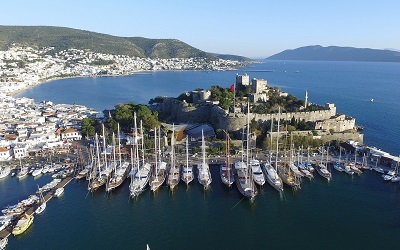 For the adventure enthusiasts among you we have prepared the splendid Hot Air Balloon Tour. 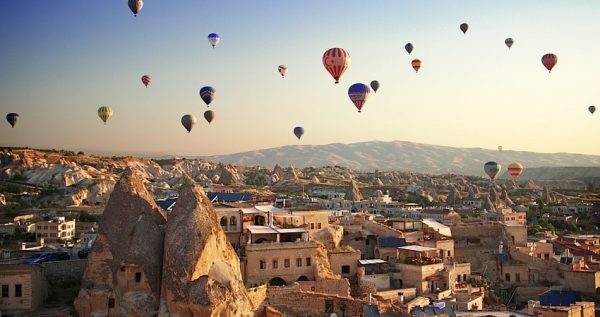 Please remember hot air balloon tour in Cappadocia is optional and has to be booked separately. This phenomenal tour starts early in the morning, with a drive to the venue, where you will have a light breakfast. After our instructors brief you on some safety regulations, our flight can begin. 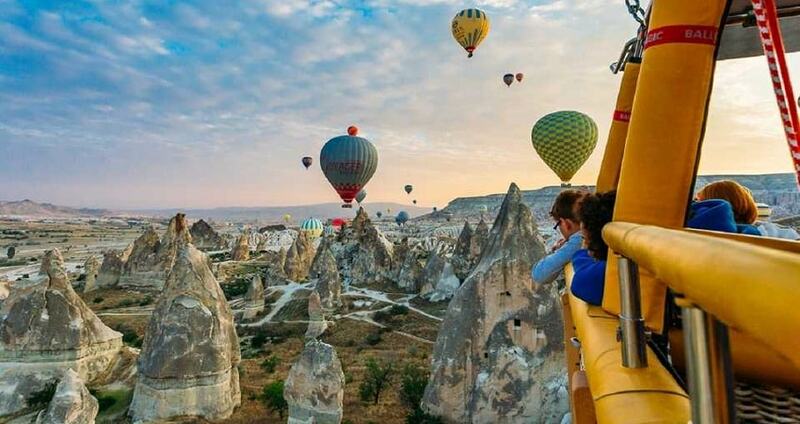 You will get to see the beautiful landscape of Cappadocia while flying among the clouds. View of the rural landscape of Cappadocian valleys becomes unforgettable from up in the air. Once we land, our team will throw a celebration with a champagne, during which you will be handed your very own Hot air Balloon Flight Certificate. Our driver will then take you to Cappadocia Inn for breakfast. Hot Air Balloon tour can be Standard which last at least an hour, and Deluxe which lasts at least hour and a half. We will continue our Marmaris Cappadocia Tour after breakfast. The driver will take us to the Derinkuyu from where we will continue on foot. 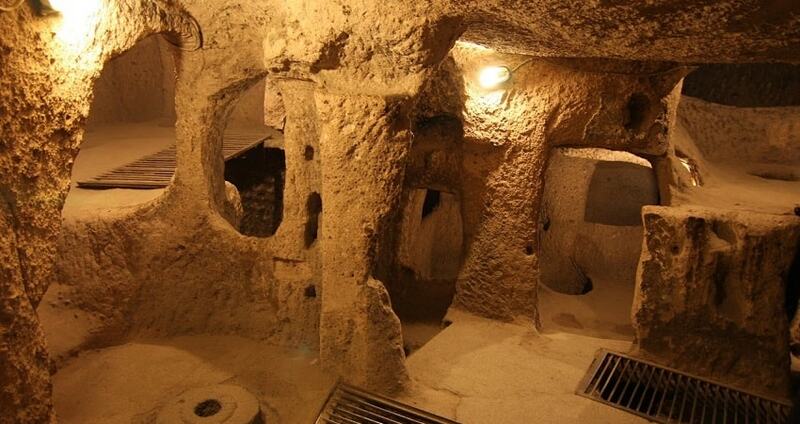 Firstly, we will get to see the impressive underground city of ancient Hittites. This underground dwelling complex contains stables, refectories, cellars, wineries, even a missionary school, and so much more. Cities like this one weren’t intended for the permanent use, they were built as a shelter during the war times. 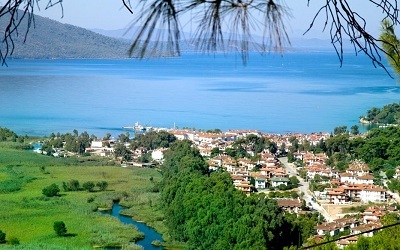 We will later take a long and relaxing stroll down the Melendiz River in the Ihlara Valley. This lovely valley features a hundred churches in its caves, and it once housed over four thousand homes. After this visit we will have lunch and visit the grandiose Selime Monatsery, the biggest religious construction in this area. Next is visit to the amazing and very popular Pigeon Valley, which hosts several hundreds pigeon houses in its mountain rocks. It was never discovered why the locals kept carving so many pigeon houses. While some say it was because the pigeon dropping was used as a high-quality fertilizer, others claim that the dropping was used in the explosive-making process. In the end we will visit the local onyx factory. You will get to learn about the making of these gorgeous precious stones, as well as their modeling into the jewelry. 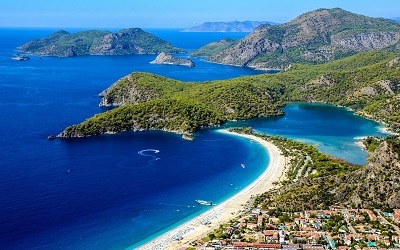 In order to partake in Marmaris Cappadocia Tour, you should be healthy and in good physical condition. Don’t forget to bring some comfy shoes, sunscreen, hat and a pair of sunglasses. Our tour lasts till about 6pm, when our chauffer will drop you off at the bus station. 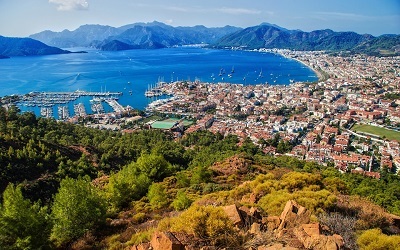 You will get two hours of spare time until our comfy bus comes and takes you on a trip back to Marmaris. 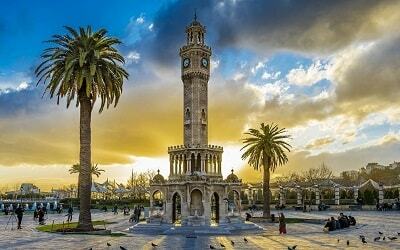 Marmaris Cappadocia Tour begins with a 770 kilometer-long drive to Cappadocia. As this trip is lenghty, we have opted to employ the services of the most prominent bus company in this area – the Rahmi Harmucu bus company. Their vehicles are well-furnished, well maintained Mercedes Trevego busses. Each bus is equipped with a air-cooling system and comfortable seats. During this trip you will be catered with a variety of refreshments and some tasty snacks. 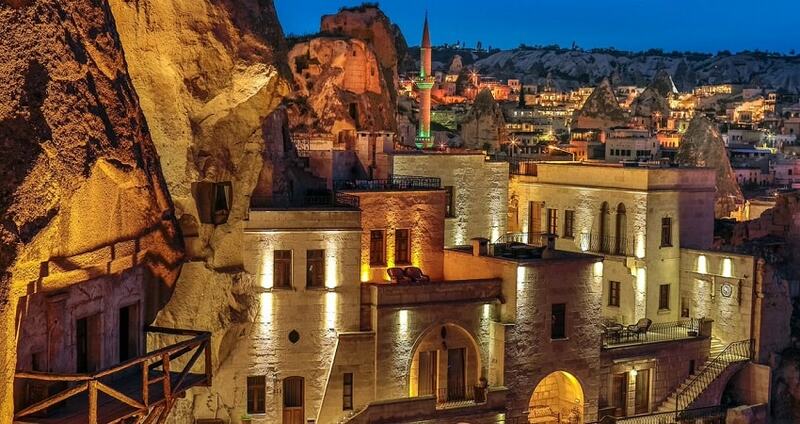 After 13 hours spent on the road, we will reach the marvelous Cappadocia Inn Hotel. After we check in, we will enjoy a yummy breakfast. Our chauffer will then take you for a tour through North Cappadocia. We will begin Marmaris Cappadocia Tour by visiting the amazing Uchisar Castle which contains a large variety rooms and secret tunnels carved into the mountain rocks. We will then go to the Goreme Open Air Museum. This glorious museum is a part of the UNESCO’s World Heritage Site list. 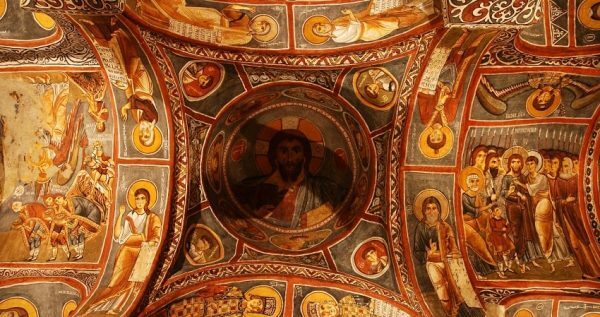 This museum has some impressive churches carved within the mountain rocks, with some astonishingly well-preserved frescoes decorating their inner walls. We will then visit the Cavusin Old Greek Village, known for the cave church of Saint John the Baptist. This church is very big in comparison to other churches of its kind. It contains three rooms, which were made out of the original one. Apparently, the support-columns had to be straightened and built into the walls so that the church doesn’t collapse and that is how the three rooms were made. After that we’ll head to Pasabag which hosts some extraordinary fairy chimneys that have double or even triple caps on top. After admiring its fairy chimneys and having lunch in Pasabag, we will go visit St. Simeon’s chapel, and a unique hermit’s shelter cut into the three-capped chimney. We will then visit Avanos to see their red clay pottery manufacturing process. Locals who make pottery gather their beautiful red clay from the bank of the nearby Red River. 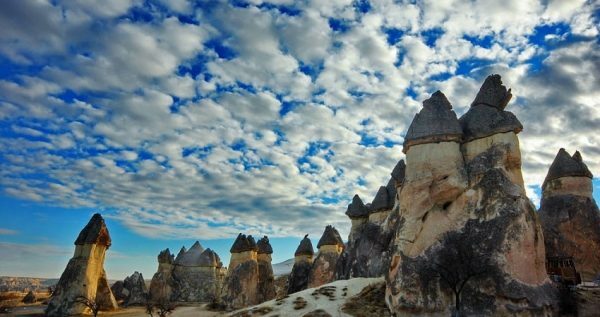 Next visit in Marmaris Cappadocia Tour is to the Devrent Valley which is popular for its moonscape featuring numerous curious rock formations. Afterwards we will visit Urgup where we will get to see somewhat bigger fairy chimneys then usual. 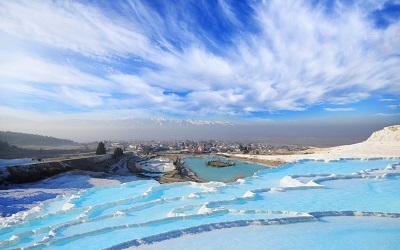 In the end we’ll go to a Turkish carpet factory in Goreme. There you will see how the gorgeous Turkish rugs are created. Once this visit is over, our chauffeur will drive you back to the hotel. For the those with a flair for adrenaline and adventure among you we have organized the fabulous Hot Air Balloon Tour. This magical tour begins in the early morning, with a short drive to the take-off spot. After a light breakfast, skillful instructors will brief you on some safety rules and measures, so our marvelous flight can start. 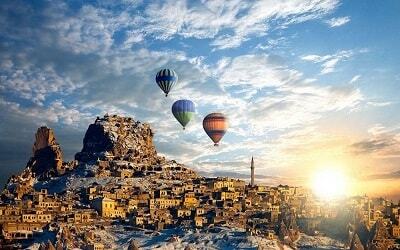 You will get to feast your eyes on the landscape of Cappadocia while floating over the summer sky. You will never forget the view of the colorful landscape of Cappadocian valleys and mountains from this perspective. Once we get to the ground, the staff will prepare a small celebration with champagne, during which you will be gifted your special Hot Air Balloon Flight Certificate. Our driver will then pick you up and take you back to Cappadocia Inn for a delicious breakfast. Hot Air Balloon tour is offered as a Standard one which lasts an hour or bit more, and Deluxe which lasts for an hour and a half or more. After a whole night of resting and relaxing, all you need is a reenergizing breakfast to set you up for the tour that’s ahead of us. 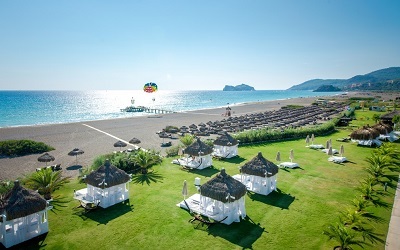 Turkish breakfast will be served at the hotel, and once it is done, the driver will come and pick you up at 9.30am. 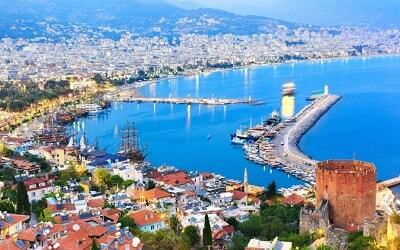 The driver will leave us in the Derinkuyu and from there we will go on foot. We will get to see the astonishing underground city of Hittites. 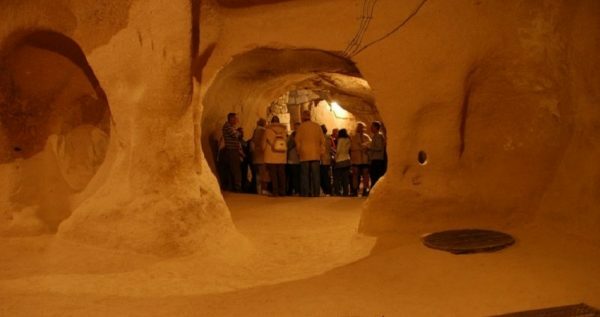 This underground complex includes stables, wineries, cellars, a real missionary school, and much more. Cities like this one weren’t made for the permanent use, but as a shelter and they were built to withstand the attacks of enemies. Afterwards, we will go for a relaxing stroll alongside the Melendiz River through the amazing Ihlara Valley. This valley hosts one hundred churches in its numerous caves, and the valley once had more than four thousand homes. After this lovely visit we will stop for lunch and visit the Selime Monatsery, the most imposing religious building in this area. 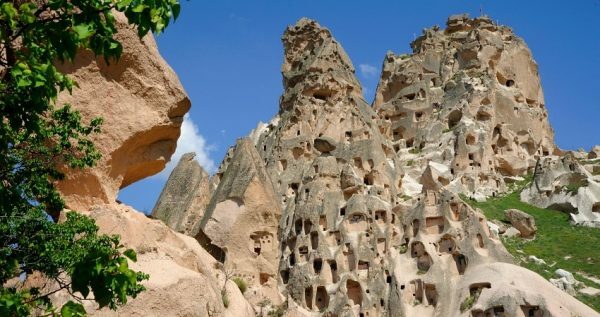 Next, we’ll visit the amazing and famous Pigeon Valley, which hosts hundreds of lovely pigeon houses carved into its mountain rocks. It was never explained why the local people kept making so many dovecots. Some claim that the pigeon dropping was collected to be used as a kind of fertilizer, while others say that it was used in the making of explosive. Next, we will stop at the onyx factory, where you will find put more about the making process of these valuable gemstones. Our tour through South Cappadocia lasts till 6pm. Our chauffer will then drop you off at the local bus station. 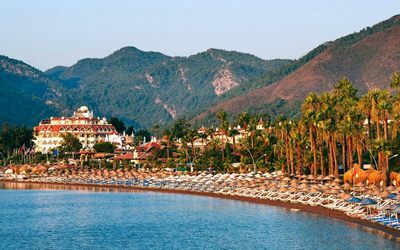 Next two hours you can use to relax and unwind, until our bus comes and takes you back to Marmaris. 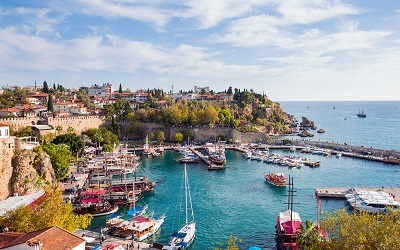 Our price for Marmaris Cappadocia Tour includes full insurance, guiding services, entrance fees, 2 breakfasts and lunches, as well as all bus tickets. We should also mention that it is necessary to put a down-payment of fifty percent and confirm your booking three days before the tour-date.